Corporate PINless dialing functionality will allow you to provide enterprise customers with PINless dialing service. It is useful for companies where multiple individuals place outgoing calls using the same caller number (typically from a company’s main phone line). In this case, a user enters an additional authorization code to correctly identify himself so that calls can be properly authorized against individual accounts and be presented, later, on a combined invoice. Print this page and use it to check off the operations you have completed while performing the system setup according to the instructions in this chapter. Please be sure to perform all of the operations in the order designated (all of the boxes should be checked); otherwise the service will not work. Associate an access number with the Prepaid card calling IVR application. 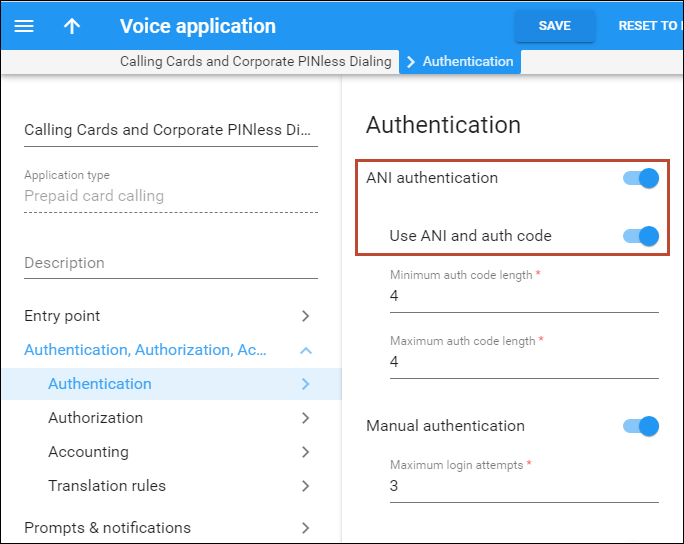 On the Authentication panel of this IVR Application, enable the ANI authentication and Use ANI and Use ANI and auth code options. Create an account with the company ID in the Associated number field. Create additional accounts to identify end users. Associate an access number with the Prepaid card calling IVR Application. On the Authentication panel of this IVR application, enable the ANI authentication and Use ANI and auth code options. · Name – Specify the IVR application’s name (e.g. Calling Cards and Corporate PINless Dialing). 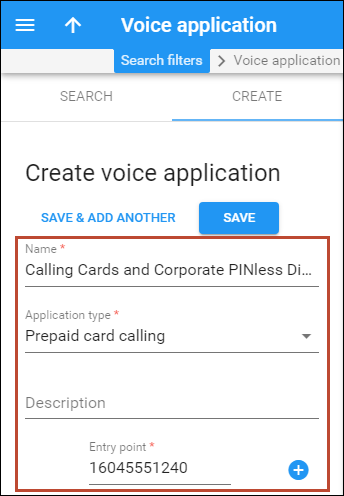 · Application type – Choose Prepaid card calling. · Entry point – Specify the actual number that must be dialed by an end user. Click to add more Entry points. 3. On the Voice application panel, go to the Authentication, Authorization, Accounting section and select Authentication. 4. On the Authentication panel use a slider to enable the ANI authentication and Use ANI and auth code options. The length of the authentication code is 4 characters by default; this value can be changed in the Min/Max auth code length fields. · ID – Specify the company’s main phone line. · Account role – Select the type of the account. Select Phone line from the list. · Service password – Specify a service password for this account. 4. On the Service configuration panel select Voice calls. 5. Enable the Associated number option and specify the company ID in the Number field. Create multiple accounts so you can identify end users. · ID – Specify the Company ID#Authentication Code (e.g. 13941#1269). · Account role – Select the type of the account. Select Universal from the list. Repeat steps 1-3 to add additional accounts for end-user identification.